1. 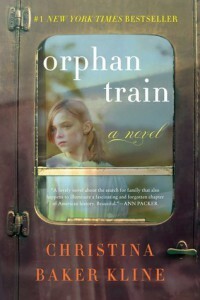 Were the orphan trains a good thing? Why or why not? What, if any, better options were available at the time? 2. What did you notice about the style of writing and how this story was put together? 3. Thinking back on the children that were highlighted in the book, Carmine, Dutchy and Niamh, what were the motivations of the families who took in these orphans? How did these differing motivations affect the children’s lives? 4. What similarities or differences are there between the past as shown in the story and our present foster care system? 5. In what ways are Molly and Vivian similar? How are they different? 6. Do you have things that you don’t use or are stored away but you can’t part with? What are those things and why do you keep them? 7. What would a timeline of Vivian’s life look like? Use a white board to diagram this or just do it verbally. What characterizes each segment of her life? 8. What would a timeline of Molly’s life look like? What characterizes each segment of her life? 9. “You can’t find peace till you find all the pieces.” How is this true in Vivian’s life? How is it true in Molly’s life? 10. Molly’s charms on her necklace are mentioned throughout the story. What is their significance? What did Vivian’s Claddagh cross and Molly’s charms mean to them? 11. How has Molly changed Vivian’s life? How has Vivian changed Molly’s life? 12. Read the prologue aloud to the group. Having read the book and rereading the prologue what does this tell you about Vivian’s view of the people in her past? What does this show about her character? 13. How did you feel about the way the author ended the story? Is Vivian’s happy ending enough? 14. If you were to write additional chapters to the book what would happen to Vivian, to Molly? 15. The American Experience, a PBS show, has a program on the orphan trains. There was also a movie made in 1979 called The Orphan Train. Do you think this book will come to the big screen? Would you want to see it?